No one can imagine how bad things must be. They sprout in the dark, damp folds of my mind. They grow there— a forest of tiny umbrellas. They flourish— a crown of terrible heads. 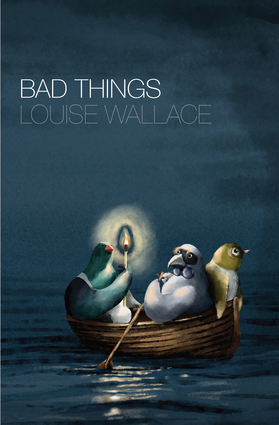 Bad Things, the new collection by Louise Wallace – poet, not celebrity housewife – is about the different ways in which we survive. Political and personal, the collection navigates celebrity encounters, women and work, the weight of expectation, and the pasts we try to escape and the people we try to hold on to. These poems are dreamlike, confronting, funny, and sometimes unashamedly weird. Louise Wallace grew up in Gisborne and now lives in Wellington. Her poems have been published in literary journals in New Zealand, Australia and the U.S., translated into German and Spanish, and anthologized in Best of Best New Zealand Poems, Essential New Zealand Poems: Facing the Empty Page, and most recently Manifesto Aotearoa: 101 Political Poems. In 2015 she was the Robert Burns Fellow at the University of Otago, Dunedin. She is the founder and editor of Starling, an online journal publishing the work of young New Zealand writers. Bad Things is her third poetry collection, following Since June (2009) and Enough (2013).